Hello and welcome to our live coverage of the final stage of the Vuelta a San Juan. Today's stage runs 141km consisting of nine laps of a circuit around San Juan, and looks set up for a sprint finish. It should be a sprint finish today, much like yesterday's stage was expected to be. The sprinter's teams won't risk a repeat performance after the break managed to stay away and contest the victory on the penultimate stage of the race though. We're just under ten minutes from the stage start now. With many of the classifications already decided, there isn't much to contest today – apart from the stage victory, that is. And we're off! The final stage of the race gets underway. Several riders are already on the attack, including Remco Evenepoel (Deceuninck-Quick Step) who will be looking to secure his slender two-second lead in the U23 competition today. The young Belgian is out there alone right now. A few more riders have made their way across to him now. Fernando Gaviria (UAE Team Emirates), Bernhard Eisel (Dimension Data), Ignacio Prado (Mexico), Leonardo Rodriguez and Laureano Rosas (both Asociacion Civil Mardan) are the riders who made it across to Evenepoel. Gaviria has 3 points in the intermediate sprint competition, so can't challenge Navarrete's 11 even if he takes both sprints today. And the break has been brought back. Gaviria too dangerous a presence for the peloton. That's one lap under their belt and no move has been established yet. Alejandro Osorio (Nippo Vini Fantini Faizanè) is among the next crop of riders to have a go. Six more riders off the front with a miniscule gap. Nippo's Osorio and Mexico's Prado are back out there. They've been joined by two riders, one from Agrupacion Virgen De Fatima and one from the Argentine national team. They have a couple of seconds on the peloton. Adrián Richeze is the Agrupacion Virgen de Fatima rider, and Rúben Ramos is the man from Argentina. The gap to the leaders is up to 20 seconds now. Prado, Osorio, Ramos and Richeze out front. a chase group has also formed. Enzo Moyano (Municipalidad de Pocito), Dario Díaz (Asociacion Civil Mardan) and Magno Nazaret (Brazil) are the chasers. ...and the chasers are caught by the peloton. Just the four out front now, 20 seconds up the road. The peloton is spread out across the road now. They seem happy with the composition of the break, who head into the final metres of lap two. That's the first sprint of the day over and done with. The break just rolls through, with Richeze leading Ramos and Prado over the line. Things have settled down now, though Richeze had a technical problem – possibly a puncture – and dropped back from the break. Peter Sagan (Bora-Hansgrohe) and Iginio Lucero (Municipalidad de Rawson Somos Todos) clip off the front of the peloton but are quickly shut down. We're inside the final 100km now. Riders are still trying to get away from the peloton. End of lap three for the breakaway. The peloton aren't far behind, but we don't have a time gap for whatever reason. The gap appears to be around 20 seconds. The on-screen graphic shows the state of play in the intermediate sprint competition. 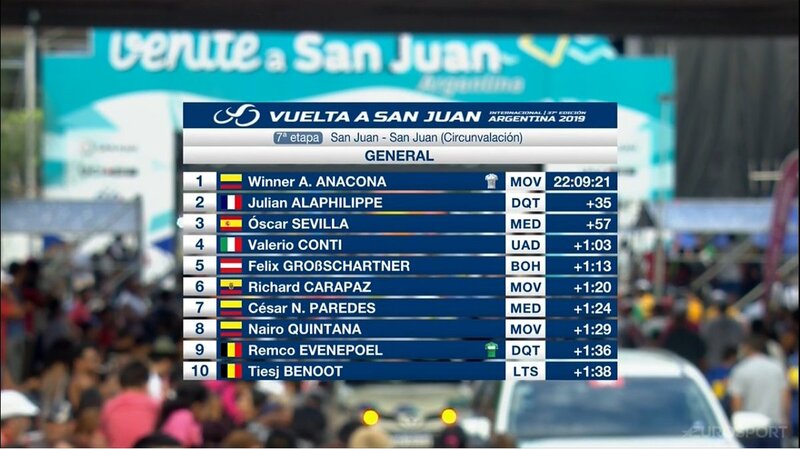 Daniel Zamora (Agrupacion Virgen De Fatima) lies second, a single point behind the 11 of Maximiliano Navarrete (Argentina). We have a couple of laps before the final intermediate sprint of the race, and with a small gap to the break, there's a chance that it could be contested. Zamora has won the mountain classification though, and is also assured of the best Argentine and best Sanjuanino prizes, so he might be content with those. A few more riders have gone on the attack. The men in question are Ricardo Paredes (Chile), Alessandro Ferreira (Brazil) and Daniel Díaz (Municipalidad de Pocito). 30 seconds for the breakaway now, a bit more breathing room. It's just Osorio and Prado left out front now. Another lap down. Five to go. We now have a new group up front after Prado and Osorio were brought back. Julen Amezqueta (Caja Rural - Seguros RGA), Carlos Barbero (Movistar), Daniel Díaz (Municipalidad de Pocito) and Sergio Aguirre (Municipalidad de Rawson Somos Todos) are the attackers. Meanwhile, Movistar lead the peloton. The break has 20 seconds. Fabio Duarte (Medellin) has made it up to the break now, making it five up front. This group has gotten a lot more leeway than the previous break of unthreatening South Americans. Probably because Movistar are controlling the peloton while having Barbero out front. The gap is up to a minute now. End of lap five for the break, so we're past the halfway point of the stage. The final intermediate sprint is up at the end of this lap. The situation looked to be settled but now the peloton is closing in on the break. The gap is down under 40 seconds. Bora-Hansgrohe are among the teams driving it on the front. And the gap is back up to 50 seconds. A few Chileans are also on the front of the peloton mixed among the Bora men. A handful of Agrupacion Virgen De Fatima riders made a brief move to the front of the peloton, thinking of the intermediate sprint for their man Zamora. But with a 50-second gap to make up and 4km to go until the sprint, they quickly disappeared. Three laps to go now. Duarte, Díaz and Amezqueta lead the break over the sprint. So Navarrete is confirmed as the winner of the intermediate sprint competition. 40 seconds between the break and peloton now. It's pretty much a countdown to the sprint finish, barring any improbable late breaks. Cuba and Nippo - Vini Fantini are at the head of the peloton now. Things are pretty calm with the gap remaining stable. Another lap down for the break. Two to go now. Their advantage is just over 20 seconds. Amezqueta pushes the pace a little, briefly gapping his companions. All of a sudden, the gap is back out to around a minute. An on-screen graphic tells us that the break has averaged 45km/h over the past ten minutes, while the peloton has averaged 43.5km/h. Back down to 20 seconds now as the peloton, led by a variety of teams, pick up the pace. There are a few Dimension Data riders up there, along with a couple of UAE Team Emirates men and one each from Nippo - Vini Fantini and Bora-Hansgrohe. An attack comes from a Neri Sottoli - Selle Italia rider, pushing the pace of the peloton up further. the break is just 15 seconds up now. Several riders bridge up to the break. Alejandro Marque (Sporting Clube de Portugal - Tavira) is one of them. It's the first time I've seen activity from the team during the race. We're onto the final lap now. Just a few seconds between the break and the peloton. Seven men up front, but they're almost back with the peloton now. And the break is caught. It's all about the sprinters now. Fernando Gaviria (UAE Team Emirates), Álvaro Hodeg (Deceuninck-Quick Step), Mark Cavendish (Dimension Data), Sam Bennett and Peter Sagan (Bora-Hansgrohe) should be the main contenders for the win today. Rudy Barbier (Israel Cycling Academy), Imerio Cima (Nippo-Vini Fantini), Luca Pacioni (Neri Sottoli-Selle Italia) and Matteo Malucelli (Caja Rural-Seguros RCA) are among the outsiders. Nicola Toffali (Sporting Clube de Portugal-Tavira) tries a move. Toffali has a decent gap already and is powering along nicely. He had a couple of seconds on the peloton, but the peloton have dragged Toffali back now. Toffali is back in the peloton now after his brief foray. Another Sporting-Tavira rider goes for it. This time it's Tiago Machado. He's less successful than his teammate though, and it quickly caught. Movistar are up front, making sure their man, race leader Winner Anacona, is safe. Emiliano Contreras (Asociacion Civil Mardan) attacks. Contreras is caught. Israel Cycling Academy and Dimension Data have duelling trains at the head of the peloton. Final kilometre now! Dimension Data lead the peloton. Lotto-Soudal make their move. It;s getting a bit messy up front. Sagan launches first! Bennet is on his wheel but Hodeg comes around the outside to power past! 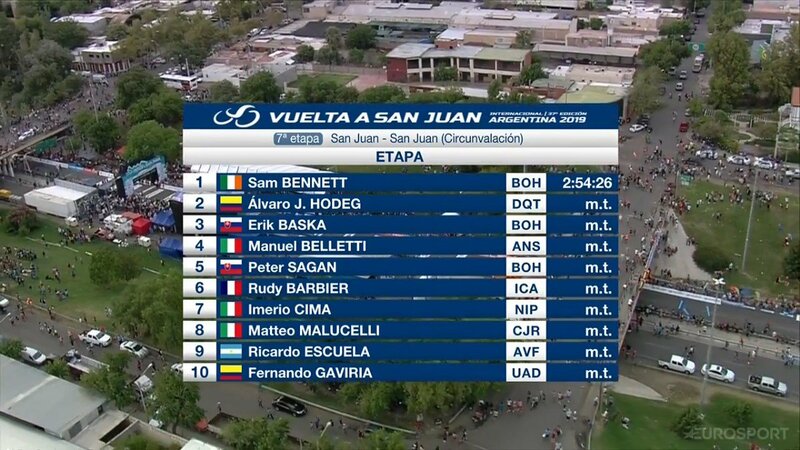 Sam Bennett comes off Sagan's wheel in the closing metres and just pips Hodeg to the line! Victory for Bennett, with Hodeg in second. A great leadout by Sagan. It looked for a second as if he was going for it and Bennett couldn't pass, but the Irishman timed it late and managed to nab the win. It's Bennett from Hodeg, with Bennett's teammate Erik Baška in third. Sagan took fifth, while Gaviria was tenth. Here's the top ten on the stage and general classification. Here's a rundown of the classification winners. That's all from us. We hope you enjoyed our live coverage of the 2019 Vuelta a San Juan!